Department of Music faculty have voted to adopt the We Have Voice Code of Conduct to promote safe(r) work spaces in the performing arts. 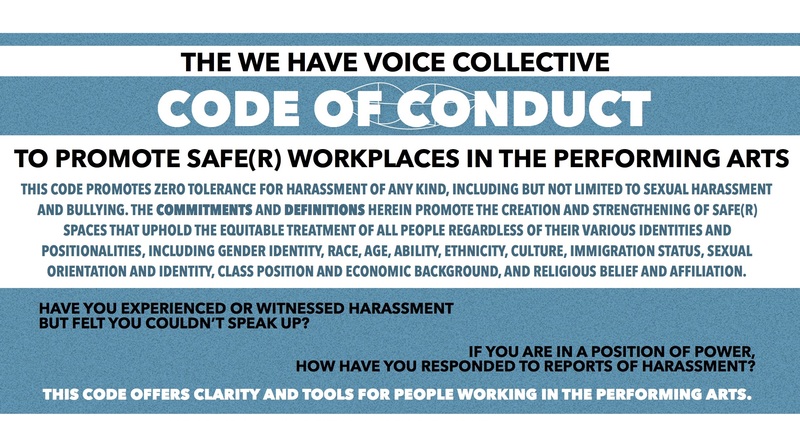 The We Have Voice Code of Conduct was developed over the past several years by the We Have Voice Collective, a group of "14 musicians, performers, scholars, and thinkers from different generations, races, ethnicities, cultures, abilities, gender identities, economic backgrounds, religious beliefs and affiliations." The code emerged in the wake of a number of news stories regarding sexual harassment in university jazz programs throughout the country. The music department's decision to adopt the code is intended to affirm our commitment to the safety and well-being of our students and colleagues. The decision was not made in response to any particular incidents in the department, but is instead a proactive gesture to ensure that this commitment is maintained and strengthened moving forward. The code will work in concert with all existing university policies surrounding harassment and discrimination, and the adoption was approved by the university's Title IX office. Beginning next year, faculty members and committees will begin the work of implementing various aspects of the code. In addition to posting the code publicly and including it in course syllabi, we will work to educate faculty, staff members, and students about the code and how to address any issues that arise. The department also plans to work with the Title IX Office and Office of Diversity and Inclusion to set-up workshops on harassment, inclusion, and maintaining safe spaces within our department.